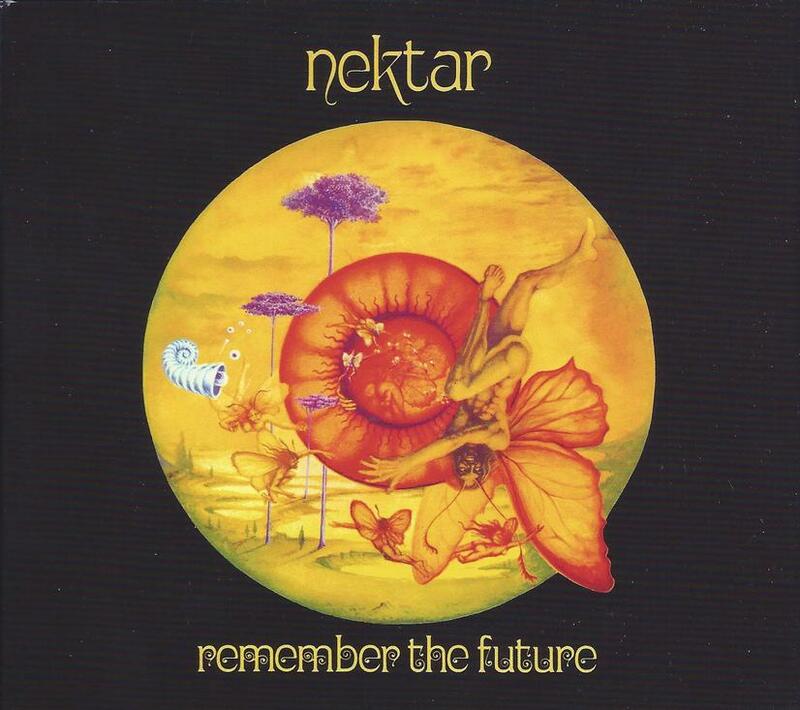 Hot on the heels of reissuing Journey To The Centre Of The Eye, Cleopatra Records’ Purple Pyramid subdivision has released a 2-CD reissue of Remember the Future, perhaps Nektar’s most popular album. Released in 1973 (’74 in the US), Remember the Future was Nektar’s third album and the first for which they toured the US. No strangers to concepts, Remember the Future was their most sprawling yet, consisting of Parts 1 & 2 of the title track across both sides of the LP. Mind expansion and new awareness were the ultimate themes of Journey To The Centre Of The Eye, and these concepts are more fully formed on Remember the Future. The album tells the story of Bluebird, a visitor to what we presume is Earth, who is shunned by the natives because of his appearance. No surprises there. Bluebird eventually encounters a blind boy and tells his story by way of visions he places in the boy’s mind. Bluebird then gifts the boy with new eyes and wisdom. Pretty trippy, huh? 1973 indeed. I didn’t discover the album until later in the decade but this was precisely the kind of stuff I was ripe for. What I always loved about Nektar in the 1970s was their ability to take hard rock into the progressive rock realm without the bombast. When they take off into instrumental passages on Remember the Future, there are multiple thematic twists and turns, but the band rock hard too, and while it’s not as overtly space rocking as Journey To The Centre Of The Eye, there are moments when Roye Albrighton’s guitar rips ferociously with an acidic bite that’s like the jaws of a T-Rex. Roye is like a cross between Jimi Hendrix and Dave Gilmour, but wholly and uniquely himself. He’s a hell of a soulful singer too, and still is today as I learned when the band toured the US in late 2011. Some of the best instrumental passages on Remember the Future are when Roye’s guitar and Allan “Taff” Freeman’s organ are front and center together. These were NOT meandering freeform jams. These guys were more than capable musicians and a tightly wound ensemble who could communicate a freeform, otherworldly feel within a carefully structured context. I think all their albums from the 70s hold up today better than many of their contemporaries, and are among the albums from the era I revisit most. The Purple Pyramid reissue comes in a quadruple fold-out box with liner notes by journalist Dave Thompson. The bonus CD includes three “radio edits” from the album, which are ok extras. But the real bonus is the 8 song “1970 Boston Tapes”, which represent the earliest Nektar recordings. For some reason that I can’t fathom there is no explanation about these recordings in the CD notes. I first encountered the songs on the 2011 It’s About Music label reissue of A Tab In The Ocean. The same songs were the bonus CD on that reissue, and the CD notes included an explanation by Roye, describing how American producer Charlie Dreyer saw the band in Hamburg, Germany and brought them to his studio in Boston to record. Early versions of New Day Dawning, Do You Believe In Magic and Good Day are here, all of which would later end up on the 1973 2-LP mega-hard rocking Sounds Like This set. Candlelight is a song that would have been very much at home on Sounds Like This, with its blazing guitar and organ. Among the other songs that never made it on a Nektar studio album are the hard rocking The Life I’ve Been Leading, the peaceful loves songs Where Did You Go and Our Love Will Last Forever, and a cover of the 60s pop song Sealed With A Kiss. Clearly this pre-record deal Nektar was making the most of the recording opportunity to cover as much musical territory as possible. It’s fascinating to hear these songs recorded in 1970 and then imagine the debut Journey To The Centre Of The Eye that came out the following year.